Digital Version is Now Available to Download via the SpringBreakGuide.com Website; Printed Version Will Be Released Next Week! College students throughout North America are now able to use the 2015 edition of the Spring Break Guide to help with their Spring Break plans. The annually released publication, which has kept college students in the know about Spring Break destinations and events for more than two decades, is known to be a significant Spring Break resource and is an anticipated fixture among college campuses throughout the United States and Canada. This year’s release marks the 23rd edition. Published and distributed by CMG Media, the Spring Break Guide promotes key break destinations, including Panama City Beach, FL, South Padre Island, TX, Daytona Beach, FL, and Myrtle and North Myrtle Beach, SC. 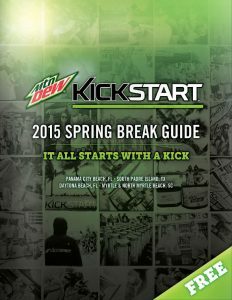 Pepsi’s Mountain Dew brand ‘Kickstart’ is back as the main cover sponsor for a second straight year. Other premium advertisers this year include Gildan Activewear and Nyne. The 2015 Spring Break Guide will be distributed throughout 25 U.S. states, as well as in Canada, at over 200 school campuses, fraternity/sorority houses, and other related distribution hubs. Its overall reach is projected at one million students when factoring in digital downloads and social media targeting. In addition to publishing and distributing, CMG Media manages the brand’s marketing and social reach via a variety of social networking platforms and digital initiatives. 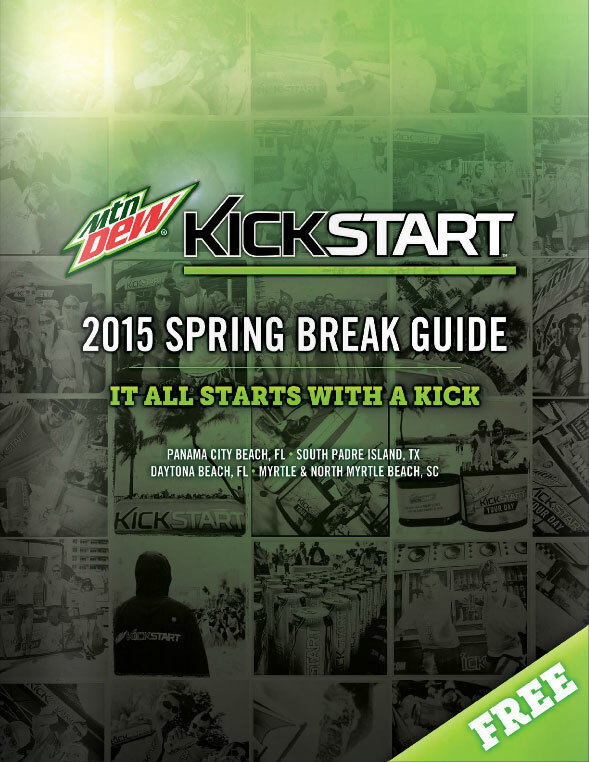 Download the digital version of the 2015 Spring Break Guide right here. For future advertising information, please contact CMG Media by visiting their website and reaching out via their digital quick connect form.